Hani Shihada, one of 14 siblings, moved from Palestine in 1979 at the age of 19 to study at the Academy of Fine Art in Rome. 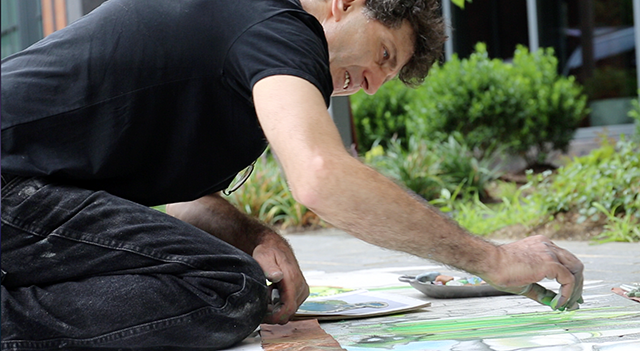 In Italy he discovered the joy of chalk drawing on the sidewalks, a 300 year old tradition. He never turned back. 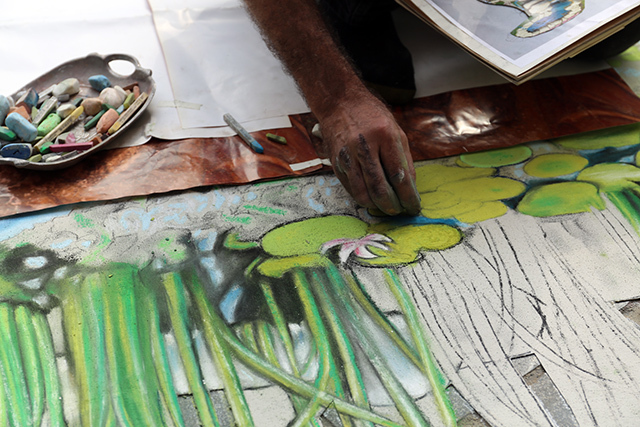 From Rome he moved to Spain, met an American woman, fell in love, and moved to New York City in 1985, where he continues to draw with chalk for a real livelihood. The busy intersections of sidewalks are his canvases, where an admiring audience will always pause, if only for a moment, to express their disbelief in the trompe l’oeil that seems to lift itself out of the pavement or appear some distance below a cracked concrete surface. 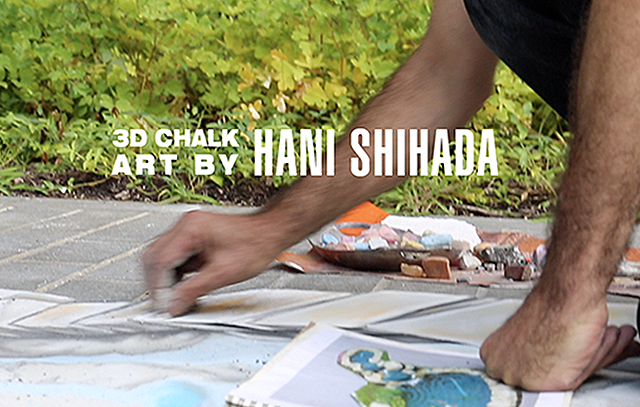 I recently had the opportunity to produce a short video of Hani where he drew on a plaza near the High Line. 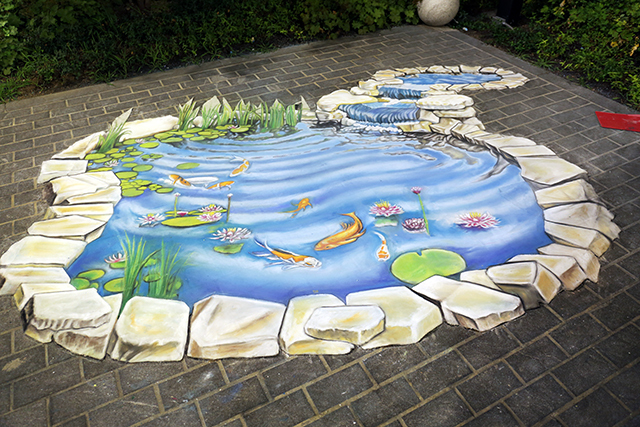 He began around 2 o’clock in the afternoon and continued until he finished the drawing of a coy pond that brought life to an otherwise lifeless brick surface. 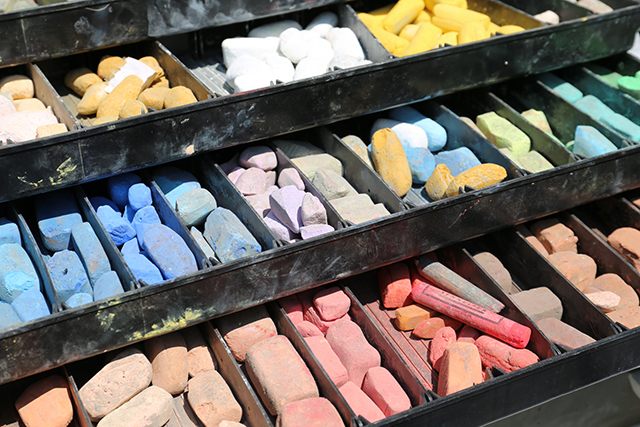 He arrived with several tackle boxes of chalk, a rolled canvas, and a sketch book. For this particular work, the client requested he paint on a canvas, so that the drawing would not mar the surface of a luxury rental apartment plaza and it could be removed and hung on display in another venue. Typically, his work remains on the sidewalk and may take up to a year to completely disappear. To make the work consistent with his 3D illusional approach, he came prepared with a canvas cut exactly to the outline of the drawing. At the height of the day, in the blistering heat and blinding light reflecting off the white canvas, he re-oriented himself on hands and knees with his back to the sun to draw in the shadow of his body. As he sketched and blended the chalk and repeatedly blew the dust from the canvas, he described to me his early childhood in the Middle East living through 3 wars and witnessing two of his brothers killed. The news today is filled with the re-ignited conflict and bloodshed between two irreconcilable nation/religions, yet his focus seemed to turned away toward the peaceful drawing of lily pads floating on the surface of his imaginary pond. As he lay on the brick surrounding the drawing, supported by one arm and drawing with the other the rocks around the water, it appeared to me that he was filling in a void with a dream image, looking for solace in his art. At 51, he still appeared in gesture to be a kid, lost in his own sense of wonder at the large goldfish that lived below the surface of his chalk pond. But here, in the blind heat of the day, with the traffic of New York passing behind him, he simply continued to fill in the details of his dream world. The water continued to flow from the upper right rock basin, cascading through two pools reflecting the clouds and rippling into the larger pond. When I broke his concentration by expressing my own surprise at the appearance of ripples in the pond, he asked me, “what are ripples?” I explained to him that they were the concentric small waves in his drawing, caused by the wind or the disturbances of the fish or the cascading of water. “I call these waves,” he replied. I explained to him the semantic difference in scale of the two phenomena, but realized that in the level and intensity of his drawing, they were indeed waves in his mind. I stood much further away, at a great distance to his ocean, and perceived the motion as ripples. But the illusion was so convincing, that I now think of them as waves. At around 6PM, a group of musicians arrived, The Ludlow Thieves, and two food trucks, Lobster and Crepes, and the Art Park Series was in full swing. Hani, less than half way finished with his sidewalk art, continued to draw while people strolled by and glanced at his work in admiration. They tossed smiles and praises at the artist, and he smiled back. Perhaps, if he had been further along, they would have tossed coins into his pond. But for the most part, he continued to draw alone, propelled by his intent to finish by 9 PM. Around 8:45, it was obvious that he would not be finished. The event, for which he had been hired, would be disbanding in 15 minutes. The musicians would soon be packing their instruments and the food trucks closing their windows and driving off. The plaza lights were now on, the last song sung in a spirited crescendo with the coming of darkness. Small crowds drifted off into the street or back into the Abington House apartments. Hani continued to draw into the loneliness of the night under the artificial light. It was apparent that he was quite comfortable in this state of mind, alone in the process. People with complements (PWC) came. PWC left. The food depended on people eating, the music depended on people listening. But Hani seemed to work in his own solitary world outside this boundary. I stayed with him: myself, photographing, and his dutiful father-in-law, organizing his chalks, were his only companions. My camera continued to capture his hand drawing and blending the chalk one frame per second. Periodically, he would blow the build-up of dust off the surface. 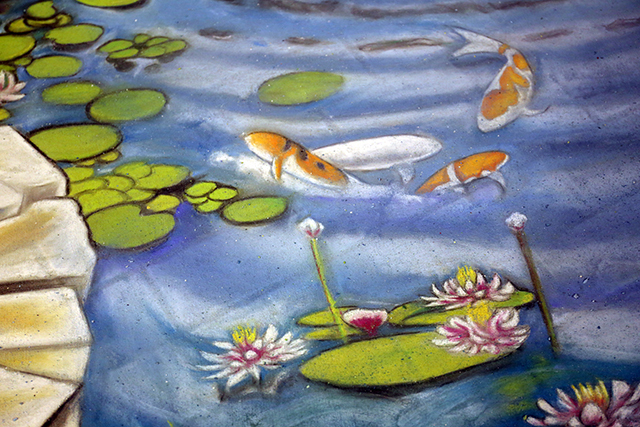 The lily pads blossomed flowers and floated on the surface of the canvas, the waves rippled toward the far side of the pond and filled around the flowers, the fish came swimmingly to life, and the rocks appeared finally as a border to hold it all together. I recorded impatiently a full 3 hours of work in a 90 second time lapse. With precision and perseverance, he worked three hours past the closing to finish exactly at midnight, signed the canvas on the far left, HaniSideWalkArt.com, rolled it up and left it with the doorman, packed his van with the assistance of his Iraqi father-in-law and drove off the plaza into the city night. I packed my equipment, loaded my bike and rode off shortly afterwards into the early morning traffic, to my studio where I would continue for three more hours loading, transferring and organizing my shots for an editing session scheduled for 8am.